The following bug may possibly depend on my setup, if so just tell me how to check this. I am using banshee 1.4.3-5 (in ubuntu karmic) and its notification area icon has a black background, unlike other applets that have a transparent background. 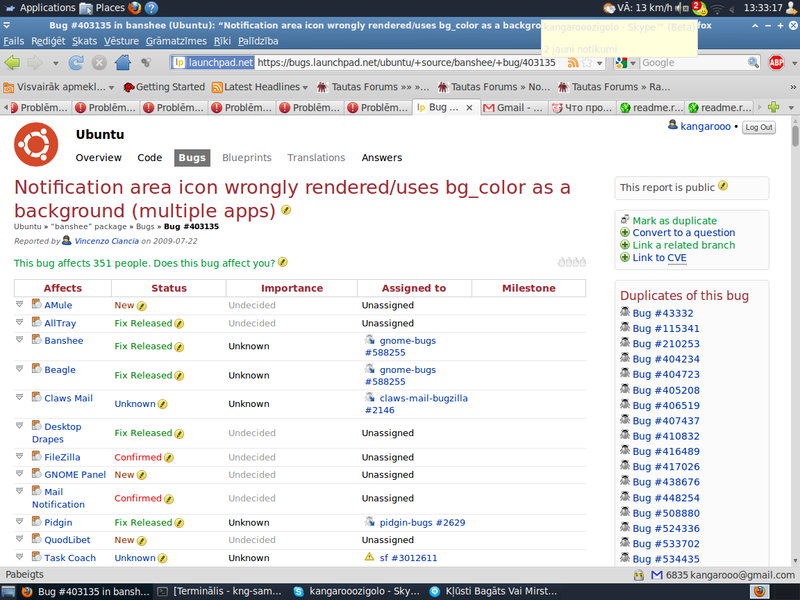 Also , see , comment #99 , might be a regression in gnome-panel since Karmic release. Can you try closing Banshee, open system/preferences/appearance and choosing a different theme - say Dust, or Dust Sand - then re-running Banshee to see if it updates its background? Tried but the black background is still there. also happened with Gmusicbrowser. Changing the themes ot the composide doesn't work. I can also confirm this bug on Karmic. I also have version 1.4.3-5. Changing the theme or panel background doesn't solve the problem. I've seen the same thing running an old build of rhythmbox that worked fine on Jaunty. I think it was fixed at some point of time (i.e. I don't see it in any previously anffected application) but I don't know which updated was it. Yes, the problem indeed seems gone now. I confirm that recent updates have fixed this bug for me (64-bit Karmic alpha 4 on a MacBook). Can you change your gnome-panel to transparent and see if the black box is still present? I am seeing it in many applications including Banshee, Exaile, and Transmission to name a few. I see a grey background for Pidgin and Twinkle. Looking at /usr/share/pixmaps/pidgin/tray/16, I find this application ships *.ico files *shock and horror*. I don't think this is related though. I'm currently getting a white background for the Banshee icon, though other icons display normally. This is on Karmic Alpha 6 with the most recent updates. I can confirm this bug on Karmic Alpha 6. 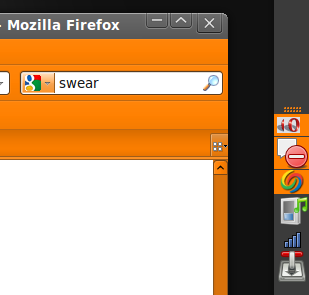 Pidgin tray icon has non-transparent background when you set the gnome panel to be transparent. "alltray" is affected as well. liferea, banshee and pidgin all show as grey backgrounds on my semi-transparent panel. Looks very unpolished. This is something that has happened in previous alphas and has subsequently been fixed. I'd be tempted to point the finger at gnome (and the way it handles icons) rather than the individual apps... But I could be wrong. It'd be nice if somebody who knows how these things work could get involved and tag this bug under the corresponding gnome project. > transparent panel. Looks very unpolished. > involved and tag this bug under the corresponding gnome project. in trunk, since it uses GtkTrayIcon. So I don't think GNOME is at fault here. 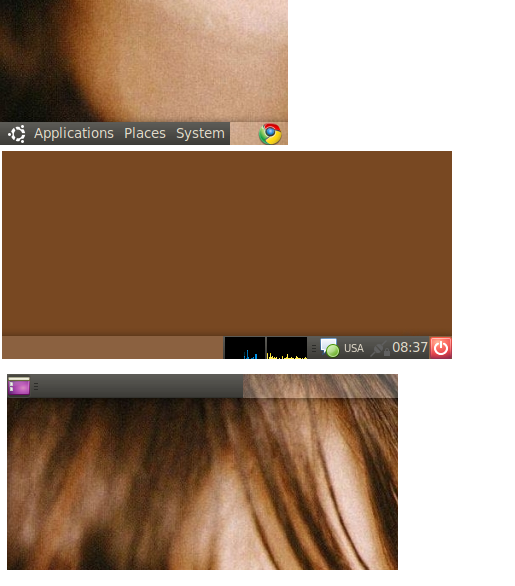 I can confirm this bug on Ubuntu 9.10 (Karmic Koala) Beta. The tray icon of Banshee 1.4.3 has a non-transparent (light gray) background when I set the GNOME panel to be transparent. other tray icons. At least that's what I see in /usr/share/pixmaps . There's a bug with AllTray because all applications that I put on the notification area (open AllTray and click on a window) have a gray background. I have this bug since my fresh update from Ubuntu 9.04 to 9.10. This is fixed in recent versions of AllTray, provided that the icons provided for the application have a transparent layer to them so that the panel color appears as intended behind the icon. However, AllTray's latest releases will not be available for Ubuntu until 0.8.0 is released (unless someone packages a dev release, such as 0.7.4dev). It is my hope to have 0.8.0 out for Karmic + 1, but this really depends on me figuring out how to implement close-to-tray, as this really seems to be the most popular feature of the software. I'm having this issue too. Ubuntu Karmic Beta. Can confirm the bug is still present in Karmic FINAL release. I've updated but haven't received the fix apparently released yesterday. I'm having the same issue with "Mail Notification". What's the status on this bug? Can we get a fix sometime soon please? I've tried hunting around the icon image files but all of them are .pngs with the correct transparency - so it's not the applications, it's something to do with the notification area, gnome or gnome-panel. Here's an image of the problem on my computer. Apparently it is related to the object applications use to create their status icon. I've heard mentions of "GTKStatusIcon" (supposedly the solution), "GTKTrayIcon" and something about an eggicon. Presumably, these are all interfaces to make the notification area icons, with GTKStatusIcon tending to be the thing cited as the answer in most of the forums and mailing lists I've seen. I don't pretend to know what all of that means, but I do know that it was working fine until Karmic. If Banshee was using method X to create a tray icon in Jaunty, it still behaves the same way in Karmic! The logical conclusion is that something has changed _outside_ of the applications which are reporting the bug. Some feedback from someone who knows anything about this would certainly be appreciated - by everyone here, no doubt. > I've heard mentions of "GTKStatusIcon" (supposedly the solution), "GTKTrayIcon" and something about an eggicon. > Presumably, these are all interfaces to make the notification area icons, with GTKStatusIcon tending to be the thing cited as the answer in most of the forums and mailing lists I've seen. > applications which are reporting the bug. > be appreciated - by everyone here, no doubt. album art, artist and title, instead giving a regular text tooltip. features, but there isn't a Gtk# 2.16 yet. +1 on Checkgmail. Jungledisk's icon is also incorrectly rendered. I'm attaching a screenshot of my cruddy looking Karmic notification area. I can also confirm this for pidgin and alltray. Confirmed. 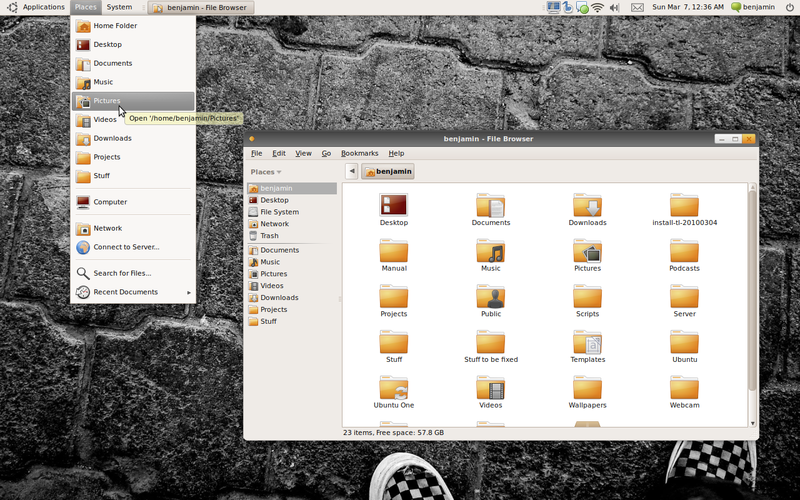 I have just upgraded to Karmic Koala and I also have a pidgin icon without transparent background in the systray. Same problem here, Banshee + Pidgin. Very ugly. Is anybody working on fixing this? On Maverick this still a bug for amsn. A fast workaround: use a theme were both colors are the same (eg. Dust Sand) or costumize the colors of an existing theme. I have built a package for Maverick following the same procedure described in comment #187 (https://bugs.launchpad.net/ubuntu/+source/gnome-panel/+bug/403135/comments/187) and uploaded it to my PPA. @Konstantinos: not working for me, see the attachment. Drapes is still affected by this bug. @Konstantinos: working for me, maverick 10.10 with "A-New-Hope-TESB" theme. Thanks. Konstantis' packages from his PPA solve the problem for me too (Maverick 10.10). @Konstantinos Natsakis: the packages from your PPA resolved my issues as well. I was having a similar problem with the Grooveshark Desktop application which uses Adobe AIR. Thanks! @Konstantinos I have been using your ppa packages for ages to fix this bug on Lucid. Did a clean install to Maverick this week and shocked to see this bug still exists. However applying your ppa does not fix this bug on Maverick for me. The ubuntu development process is failing. This bug and https://bugs.launchpad.net/ubuntu/+source/metacity/+bug/160311 are good examples. Note #2: Actually it does persist even in awn, but it somehow manages to crop it. To reproduce: resize the dock while tray icon is present (window color border should appear around it). Tested with truecrypt which tray icon has the very same problem. I updated to banshee 2.0 today. Confirm, same bug affects it in Ubuntu 10.04 with Gnome 2.30.2.
upgraded to 11.04 beta2 yesterday and the bug is still there for mail-notification. @Konstantinos Natsakis: would it be possible to provide a PPA for natty (the one for maverick solved the problem nicely)? The fix I applied for the previous releases, does not seem to work for Natty. I have neither the time nor the desire to research with this is the case, so I will not provide patched versions of gnome-panel for Natty or any following releases..
@Konstantinos Natsakis: thanks for the info. so let's hope that there will be an upstream fix. I can confirm this is an issue on Arch Linux running KDE 4.7. Is filezilla actually (still) affected by this bug ? It's really nice that Wine can integrate like this, and having the icons look perfect would make a big difference. Could you please try the new amsn 0.98.9-1 from my ppa ? this version is available for precise and quantal and it contains so many bug fixes. transparent background works for me (kubuntu 11.10). Fixed? Not yet, cf. comment 6. Closing bugs fixed in 1.5.15. Displaying first 40 and last 40 comments. View all 269 comments or add a comment.